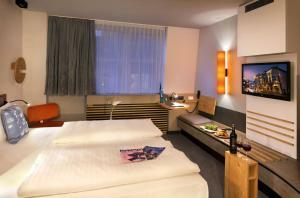 Fleming’s Express Hotel Frankfurt provides air-conditioned rooms with cable TV, safety deposit box, and minibar. 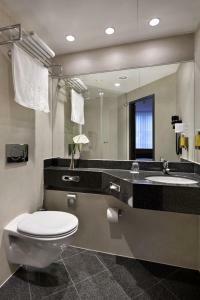 Barrier-free rooms are also available. 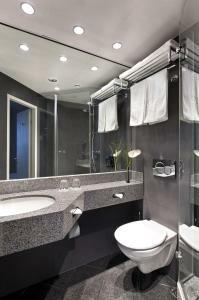 Guests can make use of the Fleming's Express Hotel's bio sauna. The gym includes modern exercise machines. 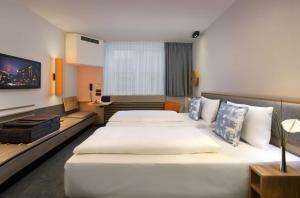 The Messe Frankfurt Exhibition Centre is just 4 minutes away by S-Bahn train. Public parking is available near Fleming’s Express Hotel Frankfurt. 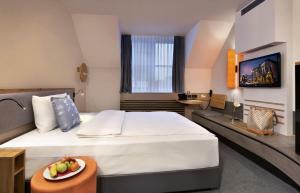 Please note from 01 January 2018 this hotel is called Fleming's Express Hotel Frankfurt. 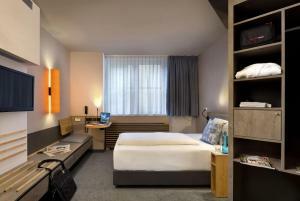 Modern room offering a TV, minibar, and a seating area. This modern room is soundproofed and quietly located. It includes a flat-screen satellite TV, a complimentary minibar, a seating area, bathrobes, slippers and a telephone discount. 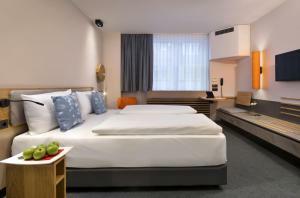 This double room features a soundproofing, air conditioning and minibar. This room is also located near the courtyard and is very quiet.